Squash House Quilts: Live Report from Sisters! What a trip so far - where to begin! After taking a wrong turn and going about an hour out of our way yesterday, we finally arrived in Sisters, OR around 3:30 pm. An incredible lightening and thunderstom heralded our arrival, but no harm was done! The good news is that it really cooled things down after traveling much of the day in the mid-90's! Mr. Squash and I were up bright and early this morning to meet some very special people at the Sisters Outdoor Quilt Show! Look who it is below - Anne from Cottons 'n Wool on the left, me in the middle and Cindy from Sew Cindy on the right! The three of us have been blogging friends for quite some time - how fun to finally meet in person! I felt like I had always known them both!! So off we went to take in all the gorgeous quilts! And look who we bumped into along the way - why it's Ricky Tims from The Quilt Show and Mr. Squash! Ricky looks a little happier to be at the show than Mr. Squash, but that is actually Mr. Squash's happy face! I think Mr. Squash might have held some hope in finding a fellow to pal around with while we gals did our thing - that is until he found out that Ricky is a well known quilter! Nevertheless, he was a great sport and spent the entire day with us! Around mid-morning, Cindy got a call from her husband Scott that he was headed into town with their three Weimaraners (I had to look up the correct spelling)...their RV is situated at the edge of town - how handy to just walk out the door and be right there close to the festivities! Here they are below with the dogs. All three dogs were just as sweet as could be! None of these photos are edited, and my camera battery (along with many others - you could hear it said all over town) died around mid-morning, but here are just a few of some of the amazing quilts! We did have a backup camera, but don't have the card reader for it with us, so when I return home Tuesday I'll be posting many more photos -- and a few more tomorrow as well! The quilt below was embellished with hundreds of buttons! The quilt below was one of my favorites (and Cindy, too) for its wonderful, earthy colors! All three of us have similar taste in quilting! This is a trip around the world log cabin quilt - amazing! Anne explained to us that the entire show is organized by Jean Wells of the Stitching Post. This is the 35th year of the show - we were here around 13 years ago when it was much smaller and not so well known. Anne said that Jean is solely responsible for what hangs where around town - we were quite impressed with how well she organized quilts of similar types and/or stories! I have much, much more to tell, but need to rest for now - we hope to see Cindy and Scott later this evening, too! Stay tuned for more! Looks like a lot of fun Candace! Say hi to Anne for me! Giggles about Mr. Squash and Ricky Timms. 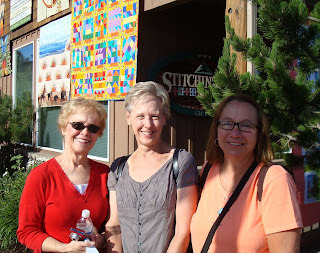 What a fun day and gorgeous weather combined with gorgeous quilts and blog friends. Oh Candace....green with envy here! Three of my FAVORITE bloggers meet up and spend the day doing what we all love best! Man or man....envy I say! Would you believe that I'm an empty nest this week afterall?! I'm so bummed as I could have flown out! Wow, eventful trip so far! How exciting to be among those beautiful quilts with good friends and your wonderful (but unsmiley) man. Thanks for all the pics! Lucky you getting to go to the show. I really like the pink pieced basket quilt you show in one of the pictures. Wasn't that quilt with the buttons gorgeous? I'd never have the patience to sew those all on. Oh, I'm so envious! Wish I could be there with all you gals and guys! Say hi to Anne and Cindy...and of course Mr. Squash. I think he and Sam would make a fine pair...matching long faces but being really great sports about it all. What a great way to spend a day, lucky you that you live so close to the venue. gorgeous quilts, and I'm sure wonderful friends to admire them with. What fun. thanks for the pics. Scott and I are now headed East on the 20 to Idaho. I truly enjoyed meeting you, Candace, and Anne. What a fun time we were able to share, a lasting memory for sure. Thanks to you and Mr. Squash for a wonderful time. Oh, and Murphy, Molly and Lily send their "paws of thanks" as well. Did Ricky Timms give any quilting words of wisdom? Mr. Squash is a good sport! Not many men would take a trip like that. Thanks for sharing with us!! I can't wait to see more. How incredibly fun! To meet up with people and see all those beautiful quilts. You're living my dream girl. Looks like one of us is having too much fun. Thanks so much for sharing the pictures. Looks like a wonderful show. Well, it was almost like being there with you. What a great show of quilts. And it was good to see Anne and Cindy. I think her dogs are so great.So glad you had a great time. Winners & Biggest Rainbow Ever! How About More Quilts from Sisters?